You are here: Home / Party Entertainment / Plan It….in your PJs! Since we started publishing Plan It! Magazine two years ago, we have been overwhelmed by the outpouring of support. People are reading. People are calling and booking the advertisers in our pages. People are thanking us for the tips and tricks we offer in every issue. And venues are calling us for more copies since the stack they received is depleted rather quickly. When you see such an overwhelming response to a new product, you know you’re hitting a need in the community. We started Plan It! as a way to expand our event guidebook at the Joe Cornell Event Planning EXPO and offer more value to our vendors and our patrons. We found it’s great fun to create a magazine, especially one that promotes Michigan business (the entire endeavor is produced in Michigan!) AND is so well-received. This year, we are expanding to TWO issues of event-planning advice, tips and ideas. 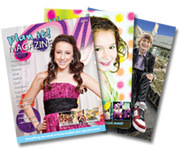 Our second issue, due out in March 2013, will feature more great content, art and ads for families looking for the next big thing or unique idea for their upcoming celebration. How can you get a copy or participate in Plan It!? There are so many ways. First, email us if you have a story idea or a business you think would be of interest to our readers. We’ll find room for you in our pages. Secondly, we welcome your feedback! What do you want to read about? What are you looking for in your event-planning endeavors? How can we help? Talk to us. One of the new features we’re likely to have in the next few issues is reader talk-back – insights and ideas from our loyal readers who are doing interesting, innovative things at their parties. Joe Cornell has always been a business focused on community and relationships. We are friends with our customers, and our customers come to us again and again – first, for their children’s events, then for their children’s weddings, then for their grandchildren and beyond. We build a legacy of celebration and warmth that keeps on giving. So join us in the conversation and let’s keep the community connecting. After all, that’s what it’s all about. For advertising information, follow this link: ADVERTISING INFOYou may also find them at your local places of worship, as well. Yikes… It’s my turn to plan my own son’s party! The recipe for successful parties revealed!